He said “of course” as if there was no other choice. Why do some manufacturers think selling without a rep in the home territory is an “of course” decision? Sometimes a small company’s founder feels customers he or she developed in the company’s early years require the founder’s continued personal attention. Other times a manufacturer thinks it’s cheaper to tack responsibility for local customers onto the other duties of a local employee. What happens when the founder is still the salesperson for customers in the home territory? One of the founder’s two jobs suffers. A founder who devotes enough time to being the salesperson in the home territory spends less time managing the company, so crucial decisions are stalled while the founder is distracted by sales calls. A founder who devotes enough time to managing his or her company can’t give customers and prospects the attention needed to grow sales in the home territory. What happens when sales calls on local customers are tacked onto the duties of a manufacturer’s local employee? The local employee calling on customers knows that every customer visit means work piling up at his or her “real” job at the company, so sales calls become halfhearted “I need to check the box that I was here and get back to the office” events. It’s a no brainer. Why would a company squander its home court advantage by assigning local sales responsibility to someone who can only make sales calls when they can squeeze them into their schedule around the duties of their “real” job. That’s why many manufacturers use reps in their home territory. They need a sales force that has one job — to call on customers and prospects all day every day. A look at our membership shows significant diversity. Our largest member employs 53 outside sales employees, the average is five employees and 20 percent are one-person operations. Forty-one members started their manufacturers’ representative businesses within the past two years. Our average member started their rep firms 33 years ago and our oldest member started in 1918. MANA manufacturers’ rep members sell into diverse markets as well, from OEM accounts, reseller (wholesalers, distributors, retailers) accounts, government accounts and end-user accounts. We really do have a diverse membership. The phrase “out of sight, out of mind” might accurately describe the perception many people have of the water and waste water treatment industry. For Carl Janson, however, it’s exactly the opposite. For the president of Riordan Materials Corporation, water and wastewater treatment are a constant in his life and in the life of his independent rep agency. 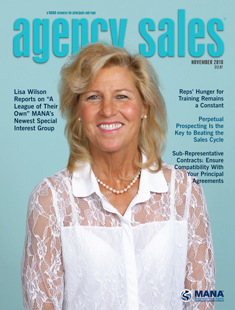 Late last year, Lisa Wilson was contacted by Agency Sales magazine to describe her efforts in spearheading a MANA special interest group for female agency owners called “A League of Their Own.” While that article in the November issue detailed Wilson’s efforts in putting female agency owners together to share and learn from experiences and best practices, there’s more to Wilson’s history as an independent manufacturers’ representative. Her agency, L.S. Wilson & Associates, Inc., Bristol, Wisconsin, specializes in motors, stainless steel coatings, surface preparation products and industrial cleaning solutions. In the past, those with lots of experience fared well, but not today. Experience can hold us back, like running against a strong wind. Experience is about what we’ve done in the past and it has value in a never-changing environment. On the other hand, expertise prepares us for what we must do next so we can face the future with confidence. This is the fifth in a number of articles serializing The Sales Force — Working With Reps by Charles Cohon, MANA’s president and CEO. The entire book may be found in the member area of MANA’s website. Years ago working with a chain of retail stores, I interviewed the salespeople. After a lot of talk with a lot of people I found out that they really hated to close a sale because the work they had to do after making the sale was so time‑consuming and difficult. Why? One of the owners was very obsessive about details. He had provided a job description and list of tasks to the salespeople that meant that every sale was followed by hours of paperwork and follow-up. Even the most successful companies are in constant competition for business. What sets them apart often boils down to one factor…outstanding customer service. I have spent 44 years focusing on customer service. I have written hundreds of articles, as well as seven books on the topic. I have also been interviewed on television and radio plus presented to thousands of customers with seminars worldwide. No matter what business you’re in, here’s some advice I highly recommend you consider. Being the biggest isn’t always the formula for success. That’s what one manufacturer maintained as he explained, “I know that I’m a small fish in a much bigger pond when it comes to getting the attention of successful reps.
There’s never been a shortage of books that come across the Agency Sales editorial desk. In a given month there will be any number of books, periodicals and articles devoted to entrepreneurship, salesmanship or the daily travails of the independent sales rep. That’s why it was so unusual when some of the contents of one book recently caught our eye. A sales representative typically will review a sales representative agreement twice — at the start of its relationship with a new principal, and then at the end. There’s a story that’s told of an old farmer who had toiled in his fields for many years. One day his horse ran away. Upon hearing the news, his neighbors came to the farmer’s house to console him. The following day, his son tried to ride one of the wild horses, was thrown, and broke his leg. Organizations like AIM/R are much more than a community of today’s membership. They’re a reflection of all those who have come before, helped build the group’s foundation and added layers of knowledge and experience along the way.